Take a ferry across the Bay of Vigo Bay with amazing, panoramic coastal views. Discover Cangas,a traditional fishing village and mix with the locals away from the bustle of city life. Enjoy a nice variety of local tapas and wines at a trendy tavern near the village port. Wine and more wine! Learn about Galician wines! Albariño, Ribeiro,Godello and Mencia… we'll cover wine history, wine pairings with food , and alot more beside. Enjoy a spectacular boat ride across the Bay of Vigo to Cangas , a coastal walk, and devour the tapas with local wine - a perfect day on the Galician Rias Baixas coast. Leave Vigo behind by ferry and head across the estuary to the small fishing village of Cangas for an gastronomic, trekking adventure. 10:15AM (be about 5min. 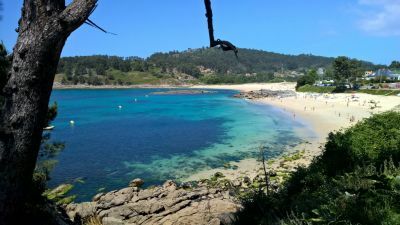 before start time) : The tour starts late afternoon and involves exploring a more remote coastal area in the Bay of Vigo away from the city! This tour leaves from Vigo on a local ferry where you will enjoy amazing sea views before arriving in the small fishing village of Cangas. During the short 20-minute trip your guide will explain the geography and history of the area — as well as explaining how the fishermen catch the delicious seafood! From the Port of Cangas, we’ll take a short taxi ride to where we will commence the four kilometre coastal walk. Take in the scenery : golden-sandy beach coves and a ruggedly, wild granite coastline. You’ll get amazing views of Spain´s top National Park, the Cies Islands. You'll have plenty of stops for photos and to breathe in all that fresh sea air. 03:15PM approx. : Our Cangas tour will finish at the Port of Cangas, where the ferry takes us back to Vigo. If you decide you want to stay longer in Cangas, you can do so (but please note that the last ferry leaves at 10:00pm). Otherwise, head back to see more of the city of Vigo. Please wear causal dress and comfortable walking shoes and in spring, fall and winter months would be advised a rain jacket. We will walk a coastal trail that has some up and down hills then flat stretches as well. Then into a fishing village. 5kms approx. Walking distance in total for the day. If there any food restrictions due to allergies, diet or religious reason please advise at the time of booking. No age limit: This is a child-friendly tour. Children between the ages of 6 and 11 inclusively are permitted on this tour at the rate listed above. Please select ‘child’ when booking. Children under the age of 6 are permitted to join this tour free of charge. Under 6 excluding any type of beverages parents would have to order their drinks. Please inform us at the time of booking if you’ll be bringing a child under the age of 6. You can do so in the special request box on the checkout page. Canovas de Castillo, 22, Vigo, at the Statue La Bañista. (You will see a wrought-iron statue with a big head called "La Bañista." It’s right in front of the Estacion Maritima.) See Location Section. Cancellations more than 2 days before departure will receive a full refund. Cancellations within this period attract a 100% cancellation fee. If any of the bars/restaurants as described above are closed due to any unforeseen circumstances we will offer a similar type venue. If we cannot get 3 tapas locations at any given time due to availability you will have more tapas at the last stop making it 2 stops. Normally it is 3 but we have the right to offer the same amount of tapas/wines tasted but at 2 venues. When you book a tour/holiday with us you agree to the above and any other terms in our general terms & conditions not mentioned above, and as well to our waiver notice. We had a wonderful trip despite wet weather. Great tour guide; we learned lots and had a great trip.